In the age of the automatic dishwasher most folks have little to no idea of how to hand wash dishes at home let alone when camping. I still see Scouts washing dishes underneath a community water spigot or, even worse, in a stream or lake. Good dish washing technique will help you stay healthy (especially on extended trips) and minimize impact in the wild. 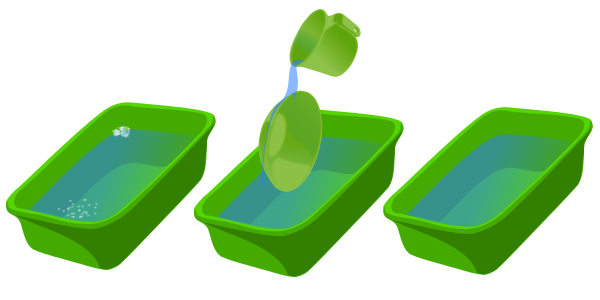 Pre-Rinse – each individual uses a little bit of drinking water to rinse out their dishes and utensils, drinks that rinse water, and then puts their dishes on the wash pile. Hot Water Wash (First Dish Pan) using as little soap as possible the dishes are washed. The cleanest dishes go first, the dirtiest dishes go last. Hot Water Rinse (Second Dish Pan) once all the soapy water has been shaken off the dishes they are rinsed in hot water. Sanitizing Soak (Third Dish Pan) rinsed dishes go into a sanitizing soak. Once the dishes are clean the dishwater is strained and any remaining food particles are packed out in the trash. 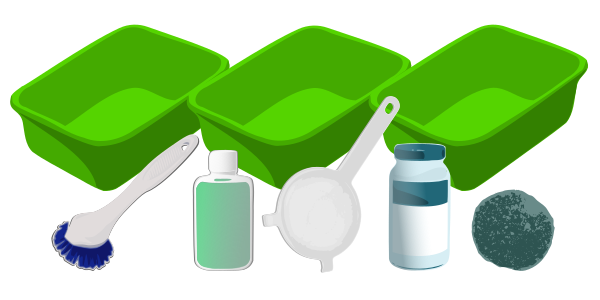 A set of three plastic dish pans (for car camping), biodegradable dish soap, a dish towel, a dish brush, a nylon scrubby pad, a strainer, and Steramine tablets. Put a couple of inches of hot water in the first dishpan (if it is too hot you’ll want to add some cold water, so go easy). Add a small amount of biodegradable soap like Campsuds – about two drops – if more is needed it goes in a drop at a time. Scouts generally use way too much soap and leave a lot of it on the dishes fouling the rinse water – once they learn to use just a few drops of soap (you can always add more but you can’t take soap out once it’s in the water) and to drain this soapy water off the dishes completely they’ll have a better result. The second dishpan gets a few inches of hot water only. 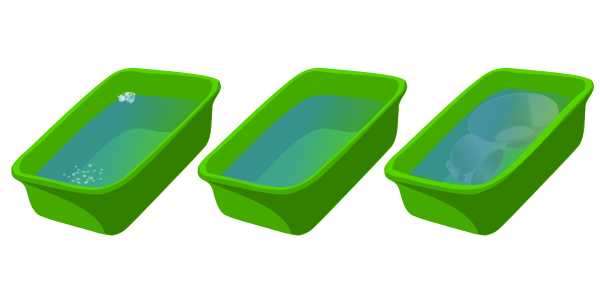 The third dishpan is filled with water (it can be any temperature) and two Steramine tablets. They stay in this dishpan for a full minute fully submerged in the sanitizing solution, drained and laid out to dry. Some sources recommend using liquid bleach in the sanitizing water, I do not. People tend to use way too much bleach (you need only one teaspoon for a gallon of water) and Scouts handling liquid bleach is a recipe for disaster. 1. Pre-rinse – Full Stomachs and Empty Plates. Everyone is responsible to bring their dishes to the wash station as free of food residue as possible (with hungry Scouts this is rarely a problem). BEFORE you put your dirty dishes in the wash pile Scouts put a little drinking water in their bowl, cup and plate; rinse their dishes and utensils and drink that rinse water. This eliminates about 99% of the food particles that would foul the wash water. Yuck! – that sounds gross but it’s not a huge deal, makes washing up much simpler and reduces the amount of dirty water that needs to be disposed of. Triage – Wash the least dirty dishes first, work towards the dirtiest, and then wash your pots and pans Always save greasy pans for last The dishes go in a few at a time and are scrubbed with a dish brush. Before they head to the next step they are drained carefully to eliminate as much soapy water as possible. Pots and Pans – Once all of the plates, bowls, cups and utensils are washed the pots and pans are next. Instead of the pots going in the dishpans some of the water from the dishpans goes into the pots, but only enough to get them clean. We do not try to clean the exterior of sooty pots and pans – there’s really no need to do this, just brush off loose soot and clean the inside of the pot. A scrubbing pad may be needed, and that pad should stay in the pot- not in the dishpans. If the scrub pad gets really grubby rinse it out with some clear water. Especially greasy pots and pans need to be tested before they are rinsed – rub a finger inside the pot if there’s grease there you will feel it and you need to wash it with soapy water a second time. As don’t pour the wash water back into the dishpans, strain it and broadcast or pour it into the sump. After the dishes are washed and all the soapy water has been shaken off them over the first dishpan they go in the second pan for a hot water rinse. Use a cup or bowl to pour rinse water over your dishes. Put rinsed dishes in the third dishpan for a full minute fully submerged in the sanitizing solution, then they are drained and laid out to dry. Pots and pans go through the sanitizing step by pouring the solution in them and swishing it around to sanitize the entire inside of the pot. 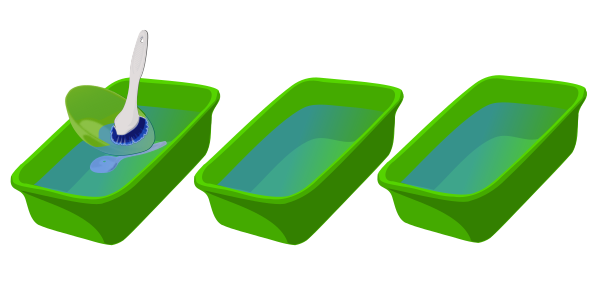 Rinsing the dishpans – Strain and broadcast the soapy water in the first pan, rinse the first pan with rinse water from the second and broadcast or sump the rinse water. Pour the sanitizing water from the third pan into the rinse pan and let it stand for a minute, then transfer to the soap pan and let stand for a minute before broadcasting the sanitizing water. Disposing of dishwater – Strain the dirty water using a kitchen strainer to remove as many food particles as possible and put the food particles in your trash. 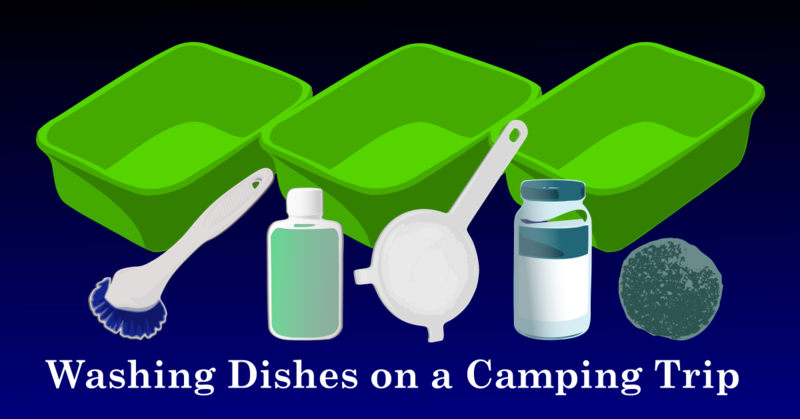 Carry dishwater and rinse water away from your camp and at least 75 steps from any streams, lakes, campsites, or trails. Give the water a good fling with a long sweeping throw to spread it over a large area. Broadcast the strained dishwater in a sunny area if possible so it will evaporate quickly, causing minimal impact. We mostly backpack, and typically don’t bring food that causes much mess. Lately, we’ve each brought a small zip lock with a some Clorox Wipes. You make tea, coffee, or cocoa after the meal (hot water), give the pot and spoon a quick rinse, and then wipe with the Clorox Wipe. The wipe goes in your trash bag, and you’ve used very little water. Who knew something as “simple” as washing camp dishes would spark such a great discussion? Seriously though – thanks for the tips. Our troop has always struggled with the bleach so very much appreciate the simple alternative. Like the nylon stocking idea as well – will have to give that try. We do this three basin process in our troop, since we learned it from our Scoutmaster outdoor training. We have to put a large pan of water on the stove to heat the water even before we start cooking, Then half the hot water goes into basin one, and the other half goes into basin two. We do use Clorox Bleach, using only a cap full of bleach in a basin. I had not heard of the tablets. I do wonder sometimes if we overdue sanitizing ourselves and gear. We did not have these cleaners when I was a boy, only regular soap and water, which I used maybe half the time. I think I saw someone get the sickest then when a kid did not rinse the soap off his dishes, and got sick at the next meal. I am concerned that we are not letting our children build up natural immunities to common bugs. It might warrant a study. The interaction between exposure to “dirt” and health is called the “hygiene hypothesis”. Search on that if you want to know about the studies. Our troop addresses this by cleaning the dishes, but making sure to include “Scout seasoning” in the food, usually twigs and bugs. If you boil them for a bit, they are just fine. I suppose it is theoretically possible to over-sanitize things and people although that’s not what I am suggesting. Dishes are sanitized one of two ways – by heat or by some sort of agent like Steramine or Bleach. Soap does not really sanitize dishes, it cleanses them of food. As I point out Scouts typically use way too much soap and should be trained to use very small amounts because too much can make you very sick indeed. There’s a number of theories around children’s immune systems, cleanliness, allergies and many other things. This falls into what I call ‘debatable questions’ – ones that cause more heat than light. There’s actually an easy way that gets the dishes clean and sterile without using any sanitizer or two additional dishpans. Put on a large pot of water right before everyone starts to eat. By the time everyone is done, the pot should be close, if not already boiling. We add the soap directly to the boiling water and we have the boys use pliers with rubberized grip handles. Dip the dishes in the boiling water and swirl them around. Follow that up with a cold water rinse (cold water kills bubbles) and they’re done! You don’t really need the sterilizing tablets because the dishes are immersed in boiling water which will kills almost everything. If it makes you feel better, you can still add a sterilizer tablet to the rinse if you want. The biggest key to this is having the boys clean their plates and wipe them before immersing. I love reading these articles and the follow-up discussions. I plan to try the nylon and Nalgene tricks on our next camping trip. Our Scouts haven’t had trouble believing the bleach rule (it doesn’t take much), but we have lost a shirt or two over the years. I heard one nice variation, save the sanitizing step until before the next meal. That cleans up anything that has been dropped in the dirt after being washed. I guess you could also keep the sanitizing water, reheat it, put some soap in it, and use it for the soapy wash after dinner. One Philmont crew put all the utensils in a Nalgene, then washed them in that. Soap wash, shake, rinse, shake, boiling water and let it sit to sterilize, then dump it, and carry the utensils in the bottle to keep them clean. There’s a number of ways to get this right. On our canoe and backpacking trips we don’t carry dishpans. We boil a pot of water, use tiny amounts of soap if needed to cut the crud, then wash dishes individually moving the soapy water and then rinse water from dish to dish. We sanitize by ladling hot water over the dishes. I like the utensils in the nalgene idea. We always do the sanitize before the rinse. Not sure why, but always assumed it was to get the bleach / steramine off of the dishes so you weren’t consuming it on the following meal? From the Steramine MSDS: SANITIZING SOLUTIONS PRODUCED WITH THESE TABLETS AT THE CONCENTRATION LEVEL SPECIFIED BY LABEL DIRECTIONS ARE CONSIDERED TO BE NON HAZARDOUS TO MAN OR THE ENVIRONMENT AND ARE IN COMPLIANCE WITH REGULATIONS OF THE EPA AND FDA. I wouldn’t want to drink the sanitizing water but there’s no harmful residue left on dishes. I imagine the same is true of chlorine bleach in the solution recommended (1/8th teaspoon to a gallon is recommended for emergency water treatment). We don’t use and, I recommend against using, bleach – it is much simpler to drop a pre-measured tablet in the water than measuring out the bleach. Nobody ever believes me when I tell them how mush bleach to use anyway – they always use too much. I am somewhat surprised by step 4 in your washing sequence, I have been on countless camps and trips away ranging from weekends to two week long stints and I have never sanitised a plate in my live. With good washing and storage there is no need. I think that there is an over reliance on sanitiser and hand sanitisers which is creating a weekness in people. I mean when I was a kid the 10 second rule applied, people freak out if you do than now. I will admit that it is subjective and you have to look at the environment that your in. However you don’t use sanitiser at home on your plates so why at camp, what are you doing to them that is different. Yes, you have sanitized a plate, probably with hot water. Your dishwasher at home (if you have one) does this or you do it manually by rinsing in hot water. The sanitizing step simply replaces a hot water rinse. I find it’s a more reliable, simpler method than hot water since it works at any temperature. It is arguable that hand sanitizers and associated precautions weaken people’s immunity – I couldn’t tell you whether they do or not. What I do know is that the jump in international travel has introduced unfamiliar viruses that often overcome local immunity. We had a dramatic outbreak of a Norovirus (commonly called a cruise ship virus) that decimated our Scout camp a couple of years ago. Our public heath people traced the vector of the outbreak to a Scout and his father who had recently returned from a trip to Spain where they became ill and then spent a week at camp. Thankfully the Norovirus is not life threatening, it’s a 48 hour digestive tract virus that pretty much lays you out. This outbreak required the camp be closed for the final two weeks of the season (causing a significant deficit financially) but most of all it made lots of people ill. I know that hand washing and sanitizing may seem a bit over the top but my experience tells me that the relatively small inconvenience is certainly better than the possible illness. I agree the hot rinse does do the role of the sanitiser and hand sanitiser has is palace especially if your using greenfield toilets where running water is not present. How I do feel that we put far to much faith is items like this and actually forget that good hygiene should take precedent. if you wash plates properly and store them in your patrol box or mess bag then, if you make sure you wash your hands after going to the bathroom and before you handle plates. You will minimise the risk and there for need for sanitiser. I agree. Along the same lines if everyone simply look sat the list of gear they are to take camping and brings everything on that list they will not forget anything, if everyone obeys all safety rules at all times no one will ever be injured and if everyone plans things thoroughly and communicates the plans to everyone perfectly you’ll have no confusion or misdirection. Naturally if you have sufficient hot water you don’t need a chemical sanitizer. We use a sanitizing step because it does not require hot water and in my opinion it is a more reliable way to assure that you have clean dishes. If there’s bread with the meal, I always save a little bit and use it to wipe out my dish before it goes to the dishpan. I can get it pretty clean that way, and no drinking grey water! I found this was one of the hardest things to teach new Scouts. Now that my Troop is more mature, they do a much better job at it and have passed that on to the new Scouts. I was hoping I could add a couple of tips. For disposing of dishwater I picked up the trick of bringing a knee high women’s nylon with my cleanup kit. You can get the cheap ones for $.25 a pair at any major store (i.e. Walmart). You strain the water through those and the food is caught at the bottom. You tie off the food at the end with an overhand knot, then tie another just above that knot. You cut the nylon between the knots and put the food in the trash. Then the nylon is ready for the next set of dishes. You can get an entire weekend out of just one nylon. My scouts thought I was crazy when I first made them use it, but now they look for one in their Patrol box. Another thing, for you backpacking folks. I know we always try to reduce weight in our packs, but I also hate doing dishes in lakes and streams as it’s not following leave no trace. So I found this collapsible sink a while back and love it. I pack a nylon in the bag with the sink and dispose of my waste water away from camp and water sources. Works great. Never thought it would stand up on its own, but it does. Some people use disposable paint strainers for catching food bits. They are a paper cone with fine mesh at the bottom. Cheap and lightweight. Our biggest pots become the wash basin when backpacking. I have an old BSA canvas folding washbasin somewhere. I like to carry a thin flexible cutting board so I have a non-dirty place to work in the kitchen. It also is a good place to put clean dishes to dry. You can get four of them for $6 at Bed, Bath, and Beyond.